Another Western nation and former colonial power, has engaged in yet another conflict with an African country, bombing from the air and attacking from the ground. We are told that France is fighting in Mali to push back ‘Islamist’ rebels (not too comfortable with the word ‘Islamist’, I’ve never heard of a Christianist) who are extremists, terrorists and fanatics – take your pick of which label you wish to adopt for the current enemies of the West. Again, as in Afghanistan, we are being told that this battle is being fought for ideological reasons. The rebels are extremists, they have destroyed ancient heritage and amputated limbs according to their literalist religious interpretations. However the idea that France has gone into Mali to fight against extremists is a myth that I wish to dispel. The West has no moral high ground; a short reading of their colonial past can easily show us that – France’s colonial legacy in North Africa reads like a state terrorism handbook. If the West was really concerned about the destruction of ancient historical heritage, limb amputations and executions then there is a state that dwarfs anything that the Malian rebels have partaken in, that state is Saudi Arabia. Furthermore, the ideology and literalist approach of the Malian rebels has its foundations in and is propagated via the Saudi state and the Wahabi/Salafi movement. The West enjoys a very good relationship with Saudi Arabia. Western leaders can often be seen hugging and kissing Saudi leaders, and enjoying the hospitality of the Saudi state, never mentioning the destruction of heritage, the treatment of foreign workers, the executions, the amputations and not to forget, the favourite subject of the West when they wish to engage in wars – the treatment of women. Our leaders are too busy flogging weapons to Saudi Arabia rather than moralising with them. If this battle is not for ideological reasons then what is it for? The answer, however cynical, is simple. Resources. Mali is rich in resources, from uranium to gold. It is an African kingdom that has historically been known for its mass of gold reserves and more recently the possibility of further oil and uranium exploration. Had the rebels expressed their love of the West and outlined their intentions to open up Mali’s market to foreign companies (allowing the leaching of resources), we would not have heard a word of objection from France, the United Kingdom or any other power. Instead, we are greeted with the scramble to take a big slice out of this African cake. Everyone is rushing to fight ‘terrorists’ in Mali. France is ensuring energy security. There should be no disruption in the flow of uranium through France’s nuclear reactors. The so-called rebels are bad for business. America had no problem flying over members of the Taliban to the United Sates when they thought they could win them over with gas pipeline deals. Their ideology was not a problem back then, it only becomes a problem if someone challenges or stands up to Western hegemony. The arrogance and ignorance that the people of the world are confronted with is astounding. Had these Malian rebels found themselves in Syria or Libya (at the time of Gaddafi) they would have been called revolutionaries, received funding, training and been armed by the West. These rebels however, are fighting a regime that is a friend of the West and not an enemy, and these rebels just happen to be in the wrong country. Maybe they should request to be taken to Syria? As with all foreign intervention there is always blowback and destabilisation of neighbouring countries. Afghanistan and the troubles in Pakistan are a prime example. The attack on a gas plant in Algeria was seemingly as a direct consequence of the Western intervention in Mali. Had the West not attacked Mali, there would likely have been no hostage situation in Algeria and most of all, no deaths. Reports emerging tell us that the rebels in Algeria were only looking for Westerners. The foreign secretary denied that Algeria had anything to do with the intervention in neighbouring Mali. The public are not so easily fooled this time, especially in the aftermath of Afghanistan and Iraq. We are reminded that the West is engaged in Mali to fight these ‘terrorists’, but the West has been happy to support groups and leaders whose human rights records have been far from exemplary. From General Suharto of Indonesia to the Afghan resistance during the Soviet occupation, the West has no moral high ground when it comes to human rights. 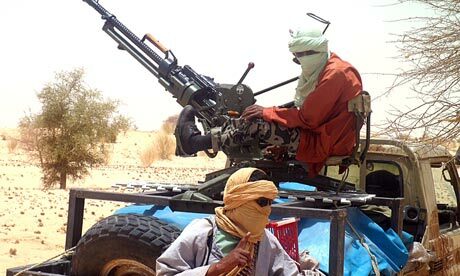 The situation in Mali would not have occurred if the Tuareg were not pushed out from Libya to return to their region, armed and trained, looking for their rights and recognition as a people. Something the colonial carving up of Africa and the drawing up of artificial borders denied the Tuareg people. There has been an alliance of different groups in Mali all with different interests, but their enemy is the same – the Western sympathising regime in Bamako. Not for a second am I defending the Salafi/Wahabi rebels or their literalist and brutal approach. I am simply pointing out the blatant contradictions of the Western powers. France and the West, in my opinion, are much more brutal than any rebel group. Dropping bombs on villages and murdering children is not something that should be applauded, but the government spin-doctors are always at hand to make us hate the people that should have our sympathy and love those that should have our indignation. One day people will look back at these so-called wars of liberation and see them for what they are – politicians putting business interests before the lives of people and painting a veneer of moral superiority when there is none.